Eric Wilder of The Grimm Report is in the house! And he’s got a new book! What if Humpty Dumpty didn’t actually fall from his infamous wall, as we’ve all been led to believe … but jumped? What Rumpelstiltskin’s “straw-to-gold” scandal landed him on the wrong side of the law? What if TMZ didn’t report on inebriated celebrities, but the marital mishaps of fairy tale icons like Beauty and her feral spouse? As a huge fan of The Grimm Report — Eric Wilder’s mock-tabloid website that satirizes popular fairy tales, nursery rhymes, and folk tales — I’m extremely excited about his new book, I, Humpty (available now at Amazon). Eric’s here today to talk about it, answer some questions, and give one lucky reader an autographed print copy of the new release. Enjoy! 1. What can readers expect from I, Humpty? I, Humpty is a collection of mock-tabloid satire that marries the reality of everyday life with popular elements from fairytales, folklore, and nursery rhymes. Rejoice with the Beast as Belle grants him permission to convert the den into a man-cave. Learn why the third little pig grows weary of his live-in brothers. Follow the courtroom drama of Rumpelstiltskin’s indictment in the Straw-To-Gold Scandal. I, Humpty covers all of these stories and more. The articles within I, Humpty were selected from a website called The Grimm Report, a fake news site featuring fairytale/current event mashups to celebrate the absurd. Creating a book gave me an opportunity to expand on some ideas I had. I invite you to take a look at the results. 2. How did The Grimm Report and its mock-tabloid stories come about? A couple of years ago I took a creative writing class at a local literary institution as an extracurricular diversion. One evening my instructor challenged students to take well-known characters in the public domain and reinvent them. That week I had come up with an elaborate story, detailing on how Humpty Dumpty hadn’t merely fallen off the wall. Instead, he was a crazed thrill-seeking daredevil who jumped. The following weekend my wife and I took a road trip. I spent the entire time chewing her ear off with other character origins. Hansel and Gretel. Snow White. Bigfoot. Every fairytale, folklore, and nursery rhyme character I could think of. I had found a new muse. I had to keep writing. I published my ideas online. Surprisingly, the url for grimmreport.com was available. 3. Sounds like it was meant to be. And this is me playing devil’s advocate here, but why fairy tales? What makes all of these classic elements so great is that many of us grew up with them, and there’s a commonly accepted understanding of each of their qualities. It’s great fun to consider what would happen if you were to drop those elements into the world as we know it today. For example, is peas porridge safe for consumption after nine days, or should it come with a manufacturers warning on the box? If you never grow old in Neverland, then wouldn’t that make it the perfect refuge for teen idols on the way out? And, if the Wicked Witch of the West can’t come in contact with water, what does she do to moisturize? 4. All great questions! As the author of my own mock-fairy tales series, I definitely understand the fun in questioning and reimagining these stories we all know so well. What are some of your favorites? There are a few characters that I have featured on The Grimm Report that I have developed a real personality for and tried to maintain whenever I write them. In my mind, Beauty and The Beast are a lot like the classic television show, The Honeymooners. Sleeping Beauty has the personality of someone who sleepwalks through life and says things that would have the reader saying, “WTF? !” My favorite character by far has to be Humpty Dumpty. I have a lot of material on Humpty that I hope to be able to publish some day. In the book you’ll see that he comes from very humble beginnings. He felt he’s always had to prove himself, and is never content with the success that he achieves. 5. How much research do you do? Do you only stick to the Grimm brothers’ versions, or does Disney ever sneak in? I try to stick to the original source material as much as possible. The Disney stuff sneaks in, but only if it’s absolutely necessary. Sometimes ideas come from real world news that I hear and then later think, “How would that affect X?” I’ve written a few articles for The Grimm Report where I asked questions like, was a troll behind the Bridge-Gate scandal? Or, could Fairy Godmother mediate budget negotiations on Capitol Hill so that everyone got what they wanted? 6. 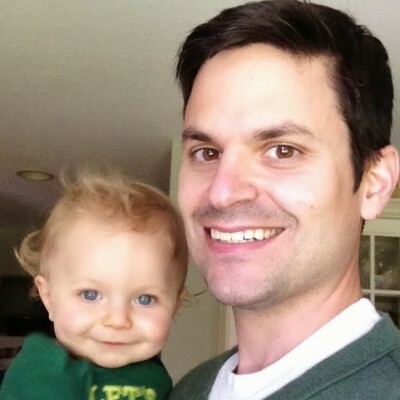 On top of running the Grimm Report, freelance designing, and publishing your first book, you’re also the father of two very lucky little ones. How do you find the time? I have to prioritize everything. Family always comes first, followed by paid work, and then writing. I don’t sleep much, and I try not to remain stationary for too long. The bulk of my work is done after 9:30 at night. I typically go to bed around one or two in the morning. Also, naptime for my two year old frees me up. I will write on my phone in a draft email if I am watching my children, and then copy and paste it later. House chores suffer, but when they are done, text to speech is activated on the Kindle. We also have a bullpen of babysitters to go to when they are needed. 7. In the coming months, what are your goals for I, Humpty? What would make you cow-jumped-over-the-moon happy? I want to share I, Humpty with as many people as possible. It’s good to hear when other people get a laugh out of it. I like being able to make others smile. There is an audiobook version that has just been finished. I plan to make that available on Audible soon. After that, I’ll get back to writing. I have many more ideas, and I’d like to develop my style to where I can present it in a full-length novel. If, and when, I accomplish that I’ll be quite happy. 8. What have you learned that you can share with aspiring writers? Write every day. Don’t get discouraged. If it takes you forever to get that sentence right, so be it. If it you have to dictate paragraphs into your iPhone while you roll a ball on the floor with your child, do it. I have. It’s better to write distracted, than to not write at all. Then, when you do get that moment to yourself, distill the information. And keep Candy Crush to a two-board limit … Maybe three. 9. What can fans expect from you next? The previously mentioned novel … and probably more pictures of my son in my Twitter feed. Eric is offering an autographed print copy of I, Humpty!! Comment below to take advantage of this great opportunity. The giveaway will remain open until 11:59 p.m. (PST) Tuesday, October 21, at which point a winner will be chosen at random. Here’s a chance to win a free signed copy of I, Humpty! All you need to do is check out my interview at Skipping Midnight and leave a comment below the article. Cheers! So glad to see Eric here, Laura! I’m a big fan of The Grimm Report and Eric in general. I had the privilege of contributing a few pieces to GR, and working with Eric is great fun — and no doubt “I, Humpty” is as well. Hey, thanks for reading the interview. I appreciate it. Haha, not sure it works that way but I don’t blame you for trying 😉 Thanks for commenting! Thanks for stopping by. I’m not sure if claiming Ned’s chance would be a net positive. Ha ha! Just kidding. But no, it doesn’t work that way. Cheers! I have had my students reinvent fairy tale or nursery rhyme characters to write business letters…love this concept. I also enjoy Jasper Fforde’s Thursday Next series that involve Nursery Crimes, so I really think I’d enjoy your book, too. 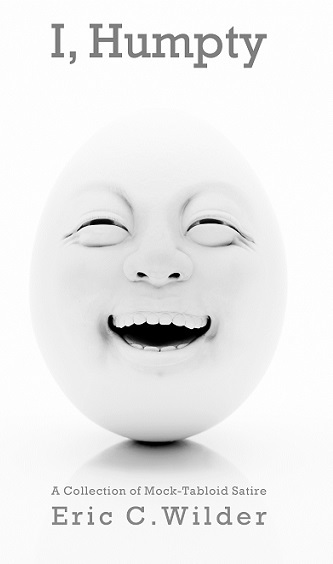 If Humpty Dumpty was an egg as an adult, what was he as a child? A confused egg-child. Which was pretty difficult seeing how he was raised on a poultry farm. Thanks for stopping by, Larry! I was never into the fairy tales except for the purpose of reading them to my kids. However, as my kids have gotten older they question things about fairy tales that make me question the same things. So, I’ve started reading spin offs of the “traditional” fairy tales and I find that it is so much more enjoyable. When done satirically as in Laura Kenyon’s Desperately Everafter or even I, Humpty as it looks to be as well (although I have not read it yet). I even enjoy the re-done versions as portrayed in shows like Once Upon a Time. Imagination is a great thing. Even if some of the original fairy tales have met their end, there is always someone out there with a brilliant imagination who will give it life again in a new way. It’s certainly interesting to take a look at these elements that were created so long ago and consider how they’d react to today’s societal pressures. Laura does a fantastic job of that. I have a great deal fun with it as well. Thank you so much for stopping by. Cheers! I definitely want to read this!! Thank you for your interest. Good luck.